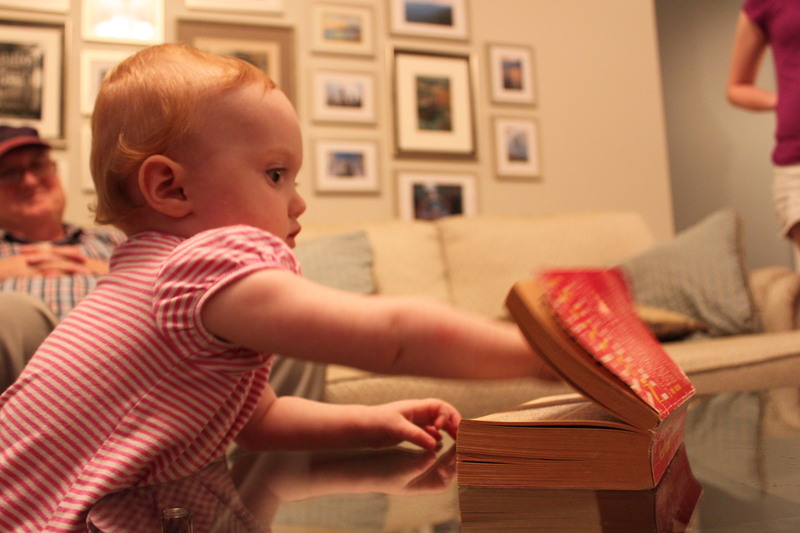 Ellie’s first bibliomanced word: escutcheon! 1: a shield or emblem bearing a coat of arms. 2: a flat piece of metal for protection and often ornamentation, around a keyhole, door handle, or light switch. 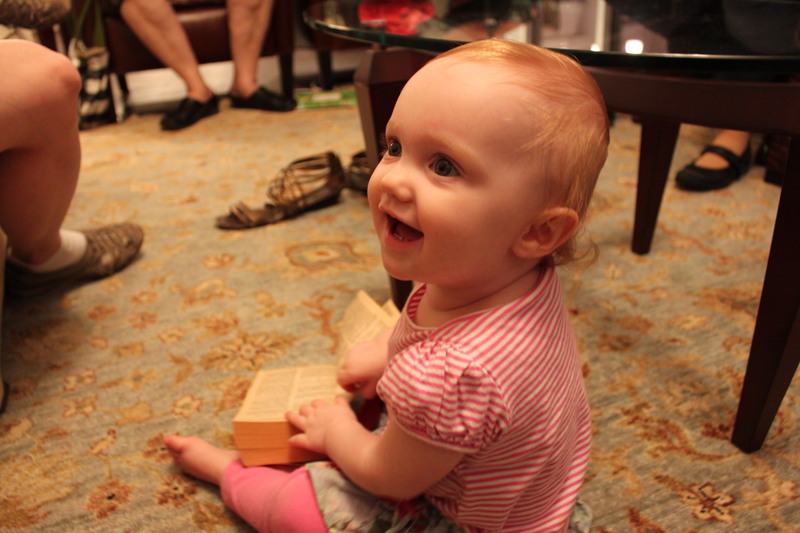 *My sweet little niece Ellie picked this word in her first ever bibliomancy. She just turned a year old. I got the chance to visit with her, my cousins, and my aunt and uncle in July in Atlanta. Growing up as an only child, I spent a lot of time thinking about my proximity to others and about being alone. When I was surrounded by other people, I often wanted solitude. But when I was by myself, I worried about being alone. Sometimes, I was lonely. It wasn’t until my twenties that I could actually enjoy time spent by myself without the fear of missing out or being left out. I learned when I wanted to spend time with others and when I wanted to be on my own. In July and August, I had the opportunity to spend time with family. I come from a large extended family on both sides, and I know at times I have taken this family, and the warmth and connection of this family, for granted. There have definitely been moments when I have focused more on our differences than what we share. And in these times, I have felt isolated or judged, as if I didn’t belong. What I have not always realized is that often I was the one who was stepping back and creating rifts, even if this was out of a sense of protection. 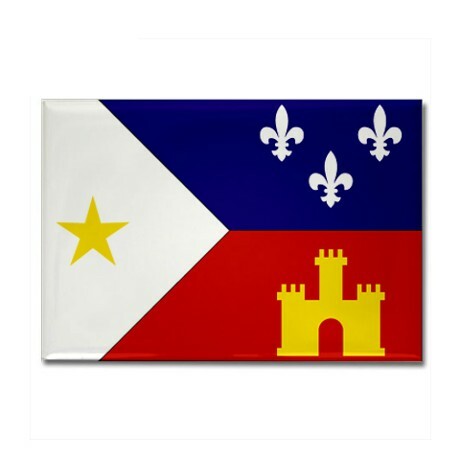 Of all of my relatives, I am one of the few to move away, out of Louisiana, living outside the state for the past decade. Most of my cousins live within a mile or two of their parents and in close proximity to one another. There is a beauty to this kind of cohesion, this intimate distance. In my mid-twenties, some part of me knew that only by leaving would I be able to come into my own and discover who I wanted to be. I knew that I must separate from my family in order figure out who I was and how I wanted to build my life. Yet, I also believe that knowing that my parents and my family are there and that I can return at any time is one of things that has allowed me to have the confidence needed in moving away, in experimenting with risks, in encountering old wounds and healing them. Traditionally, coat of arms were used as a way to identify individuals and clans and to proclaim military prestige. In heraldry, one part of the coat of arms is the escutcheon, where symbolic images are identified that often have to do with the individual wearing the shield. Another portion is the crest, which looks like a scroll, where a family surname is identified. Although typically described as “family crests,” coat of arms are not just representation of a clan or family; one portion of the coat of arms identifies the family and another part identifies the individual family member. 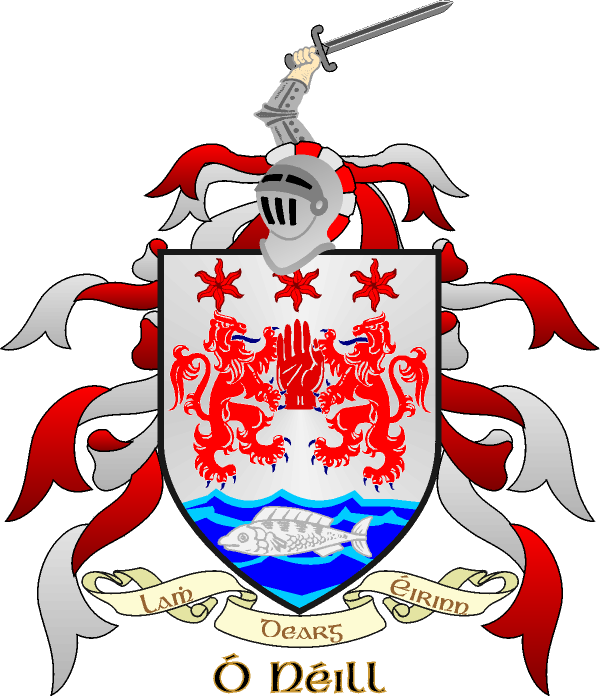 At my grandparents’ house, there was a plaque that hung on the wall with the O’Neill coat of arms. In the escutcheon are two lions, representing the tribes of Judah and the lions are upright holding a red hand. The legend of the hand’s meaning was told to me many times growing up. When boats of ancestors were headed for Ireland, there was a promise that the first man to touch the land would rule so one of my ancestors chopped off his left hand and threw it ahead onto the land before the boat came ashore. When I was visiting my aunt, uncle, and cousins in Atlanta this July, my Uncle Danny O’Neill pulled out old family photo albums: ones my grandmother made of she and my grandfather’s courtship, older ones of my grandfather as a young boy, and his mother, my-great-grandmother. My uncle had scanned the pages and pulled them up on the TV. As we scrolled through, looking at these people we came from, I felt a sense of closeness that I don’t know if I’ve recognized before. All of us—with our individual noses, our particular way of seeing the world, our penchant for kinds of food—all of us are made up not only of the same matter as all humans but of particular matter made from shared people. Somehow remembering this grew in me a sense of deep appreciation and gratitude. We may not agree on everything, we may live in different places in different kind of houses, we may have different beliefs or priorities, but we also have in common character traits, upbringings, a shared history. It seems not to matter that this shared history has patches missing. We share both the known and the unknown and somehow the legacy of those people that came before us lives in our blood. When my grandfather was about my age and already had a pack of mouths to feed, he began taking night classes in journalism. I have his journalism notebook and the attention he took with his notes reveals to me that this was something he deeply cared about. Writing was something he loved and wanted to be better at. My most vivid image of my grandpa is him laying on a couch with a stack of fifteen books on the coffee table in front of him. He was insatiably curious. About everything: psychology, sociology, literature, history, politics. He liked to ask what other people thought and have rousing conversations. I bet he would have made an amazing journalist. As it happened, his father had died young and he had to begin work when he was a young teenager to support his mother and his brother, seven years his junior. He worked as a porter for the Pullman Railroad, packing laundry and shining shoes, and eventually worked his way up to superintendent in New Orleans. When he had made enough money to support a family, he married my grandmother and they had five children. Somehow, I find some sense of assurance. Because the story didn’t end with him. 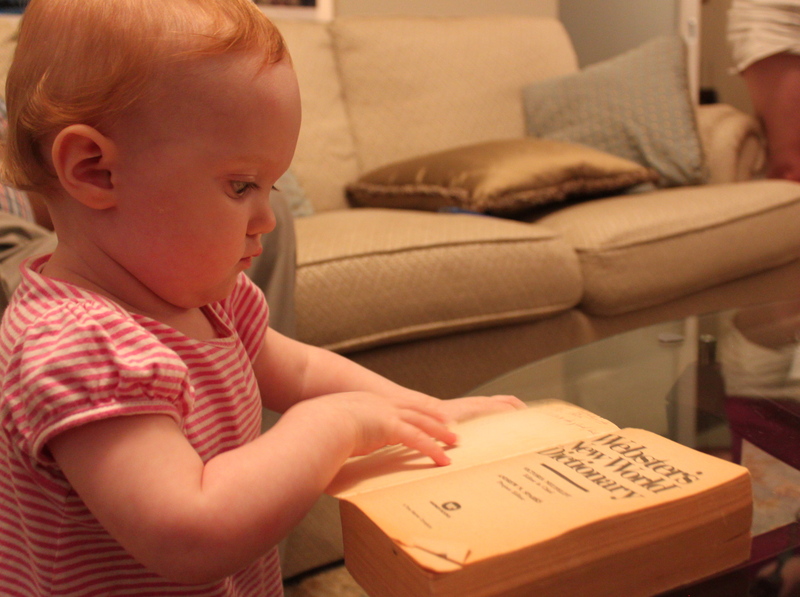 His second son inherited his curiosity and his love of reading and conversation. And this son’s daughter inherited this from him. I like to think that the passions and creativity of my grandfather did not die with him but rather live on in me. As I write, he is here too, in the blood coursing through my veins and the skin on my fingertips. In this way, family is about more than our individual selves or even the dynamics, both helpful and harmful, that we play out over and over again. Family is an intricate web we are a part of, a web that spans out. And when we die, our dreams and struggles and faith and beliefs are still there in the presence of those we share this link with. This web gives a sort of reassurance in a country that prizes the self above all else. We can rely on one another, and we can, if we are lucky, see the intricately woven ways in which we are connected. I have at times felt disconnected from my Cajun family, who live in rural Louisiana, three hours and yet a world away from New Orleans. I have felt somehow different for growing up in a big city, for moving away, for loving my family and yet needing to be on my own. I was never greeted with anything but enthusiasm. I was certainly never made to feel unwelcome. This anxiety about belonging came as I aged and saw differences I didn’t know how to reconcile. Over the years, I have felt connected and disconnected in varying degrees. When, I visited family this time, my focus was not on this question of belonging. I was instead just grateful to spend time with everyone. Much of my mom’s family had gathered with very little notice to have lunch together. I saw my cousins’ kids who I remember holding when they were born. I congratulated one of them, Jada, on her recent marriage. I heard about school and sports and new jobs and new pets and recent successes and struggles. I was able to deeply hear and engage because I wasn’t stuck inside my own stories. I wasn’t concerned about whether I belonged or not, because I somehow understood that I did. I see now that we share more than we don’t and this is a gift, this deeper wisdom. When we create our own families, not only by joining in marriage or procreating but by forming relationships with friends and being part of communities, we look to find people who share similar values. And these chosen families are tremendously supportive and beautiful. I have people in my lives who show up consistently and with care to celebrate and to grieve. But I also know, that if I were to call on my blood family, they would show up, too. For those of us lucky enough to have families who enjoy each other’s company and who love one another regardless of whether we approve of every choice made, we have a refuge not to be taken for granted. I think of the image of two hands, palms up and open to form a vessel. We have a place to be held. When I was a kid, I used to both love and hate to play freeze tag. I remember the exhilaration in running around and making it back to home base, safely. I remember the terror when I was about to be caught and the visceral sense of relief when my fingers tapped the wall, or the tree bark, or the metal of the jungle gym. Although that fear was real, the stakes are not very high in freeze tag. Okay, so someone freezes you in place. Then a team member comes and unfreezes you. Maybe you are frozen again. But eventually, the recess bell rings and you go back into the classroom, you go on about your day. But in life, running around without a sense of when we might be caught—by fear, by grief, by illness, by loneliness, by scarcity—the stakes are much higher. So, it feels all the more important that we have people we feel connected to. Family can be a sort of home base. A place to rest even when resting does not mean relief. A place where we are deeply known and accepted. A place where we can gain strength to launch back out into the uncertainty of life.